Intense networking and skill of identifying the best among ordinary are the indispensable traits that set us apart in the market. We are the reputed organization engaged in supplying building materials to Construction Industry. Manufactured under great precision, the Building Materials, supplied by us, are demanded by the eminent contractors, and other infrastructure development companies of the Indian Market. 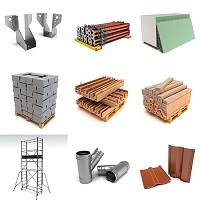 Our range of material encompasses Bricks, Sand, Metal, Iron Rods, Cement and so forth. Additionally, we offer these materials at the industryâ��s best price. We have highly qualified team who maintain the highest degree of excellence in products through proper selection of quality products from the reputed manufacturers. All the products, offered by us, are tested on the various parameters of quality and other related norms of the Industry. As a result, we supply the best building material which in turn termed us as one of the most accounted Construction Material Supplier in Saurashtra, Gujarat and India.